The United States first began taking a nationwide census in 1790 and has continued the practice every 10 years since then, for 220 years worth of population data. The number one most populous city when the census began still ranks as the most populous city today. If you guessed New York City, you’re right! The city grew from 33,000 people to a whopping 8.2 million in 2010, a growth of 24,675% in 220 years. The city’s current population more than doubles the number of people that lived in the nation when the census began. 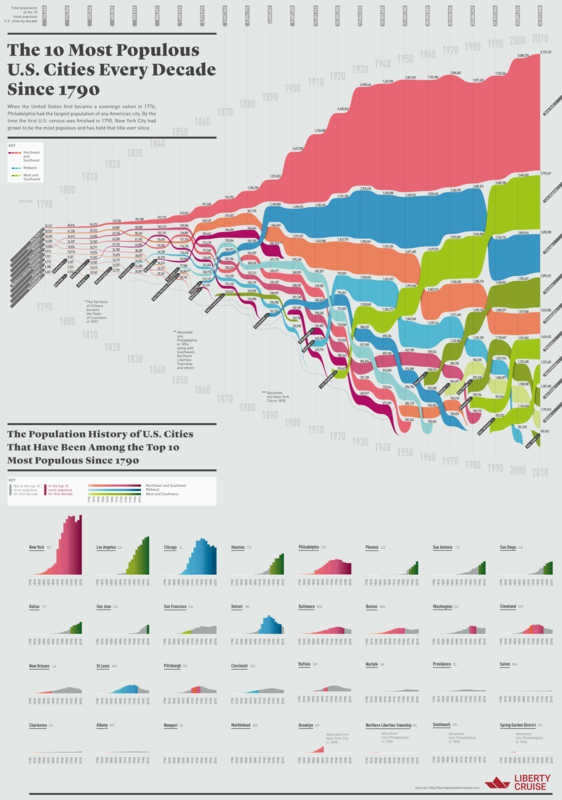 These census numbers that you can find on this infographic from LibertyCruise.nyc by the decade represent a shift in the population as more Americans started moving west in search of land and new opportunities. The top ten most populous cities in 1790 were all located on the east coast, while most of 2010’s top ten most populous cities were located in western states. California and Texas tied with three cities each that landed in the most recent top ten. How does your city’s census numbers compare?